"...candles gleaming inside, painted candy canes on the tree." What? Too early for Christmas music? Sorry. I can't help but feel all cozy and Christmasy in my little house tonight. You see, while most of the nation is starting to think spring with budding trees and blooming flowers, those of us who call the arctic tundra North Dakota home are dealing with our own spring normality: a March blizzard. March blizzards are a monster breed of blizzard, usually producing more ice and sleet than storms earlier in the year because of the warmer temperatures. (We're now having daily highs in the 20's as opposed to single digits. I know, really warm.) And this current March blizzard hasn't disappointed us. It's terrible out. Like so terrible that there's no travel advised in almost every corner of the state. We don't close the roads for just any storm, so yeah this one's a doozey. But enough about storms. This post isn't about the exterior frost on my windowpanes. Instead I'd like to share a bit about a more permanent interior frost some of our windows are sporting. It's my pleasure to introduce you to our new BFF: frosting film. 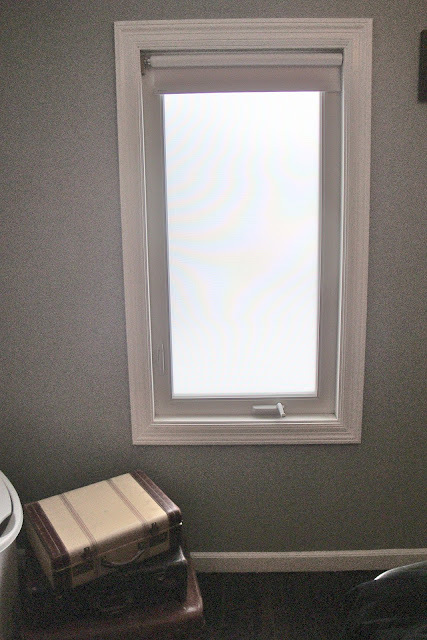 The highest priority window was this one in our bedroom. It's a nice big window that gets great light but doesn't have the best view. 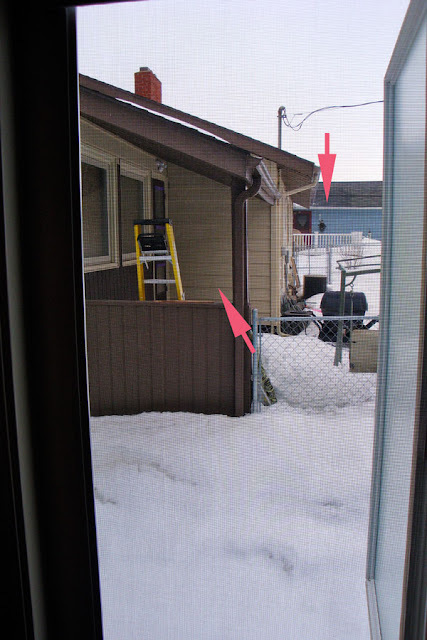 In fact, we can see two neighbor's back porches from it. And they can see us. See the arrows in the photo above? Those are the two porches. It needed to be frosted. In a big way. And we love the end result. Our blackout shade can be open to allow for the natural light to shine right in. And the frosting really diffuses the light nicely, providing a nice wash across everything. Stay warm out there my friends.